After completing a hike up Black Mountain last year I turned my attention to the next summit in the area. So for the past year I have been planning on doing Saint Marks some time this season. Since I wanted to do it as new summit in my Summits-on-the-air program it made sense to have Ralph along so we could both get it in our logs. So a few months back I talked it over with Ralph and he was willing to give it a try. A few weeks before our ascent I saw that John Bell was in the area and I invited him along. He was already booked that day but the day before the hike his plans fell through and he was available. So our adventure begins with Ralph arriving at my house at 7am and us loading into my wife’s electric car for the journey to the trailhead. We met John at the start of the Cypress bowl road and drove up the slope together. We were early enough to find a close parking spot and so we got settled in and our gear on for the hike. 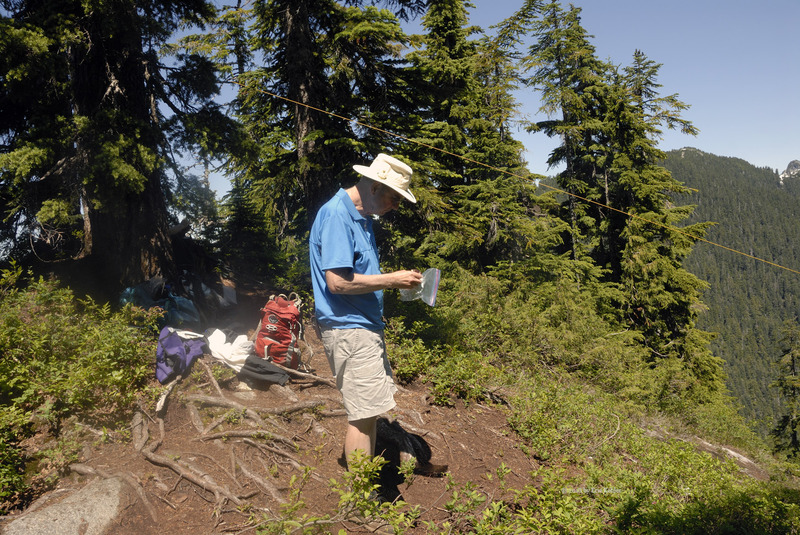 Having John along made life on the trail easy as he has hiked the summit before. He took us on a slightly longer route but one that is more scenic and interesting. 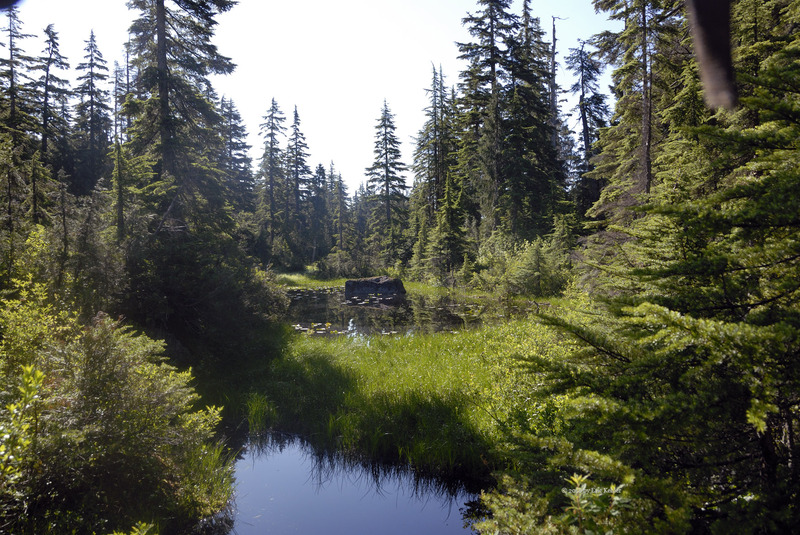 The first section of trail is through an old growth forest and some pleasant lily filled lakes. 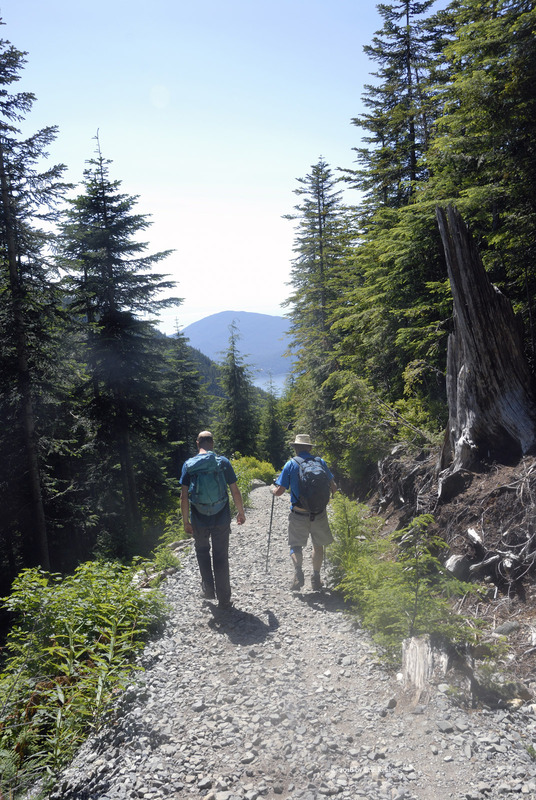 The trail then ascends up the lower slope of Mount Strachan as it makes its way north and to the Howe Sound Crest Trail. 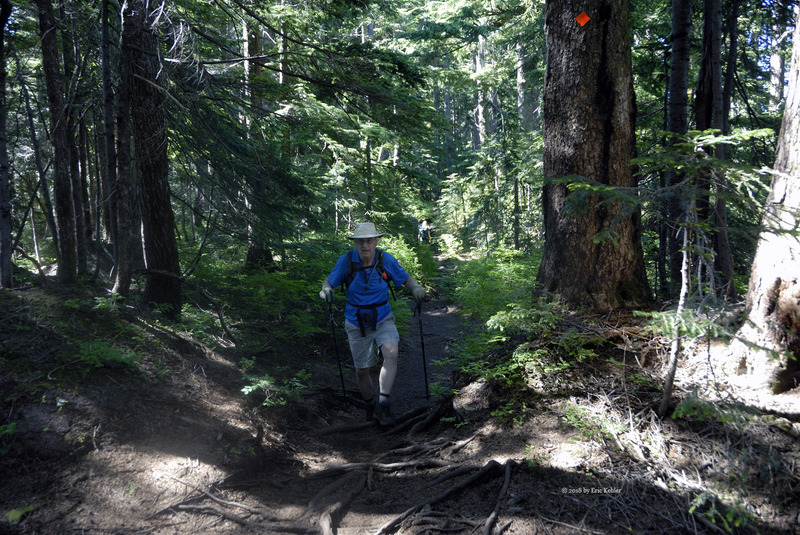 The early section of the trail in very well maintained with a solid gravel bed to walk on. Even though it was steep in places it made for a quick walk to the ridge. Just past half way point the developed section of trail stops and one continues on the original one. Now it is still a decent trail but one has to now place their feet carefully due to the many roots growing across the trail. This section of the hike was much slower and tiring. After a second steep section we emerged near the summit of Saint Marks to find dozens of people roaming around enjoying the various views from the numerous lookouts. 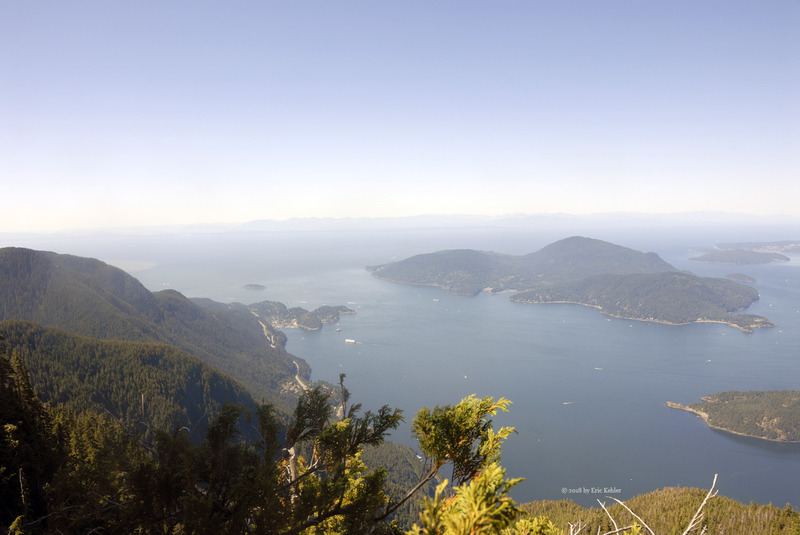 The views of Howe Sound are indeed truly amazing. After taking in the sights ourselves we stopped to eat lunch as it was only 11:30 the trek having taken us about 3 hours. Once we were done eating we started scouting out a position to set up our radio gear for making some contacts. Ralph had his KX1 for CW on 20m, John set up his small transceiver on 40m in the voice mode and I used my hand-held with the 4 element yagi on 2m. Ralph was the first to make a contact but he struggled to pull in the needed 4 due to a very busy CW contest that was crowding the bands. 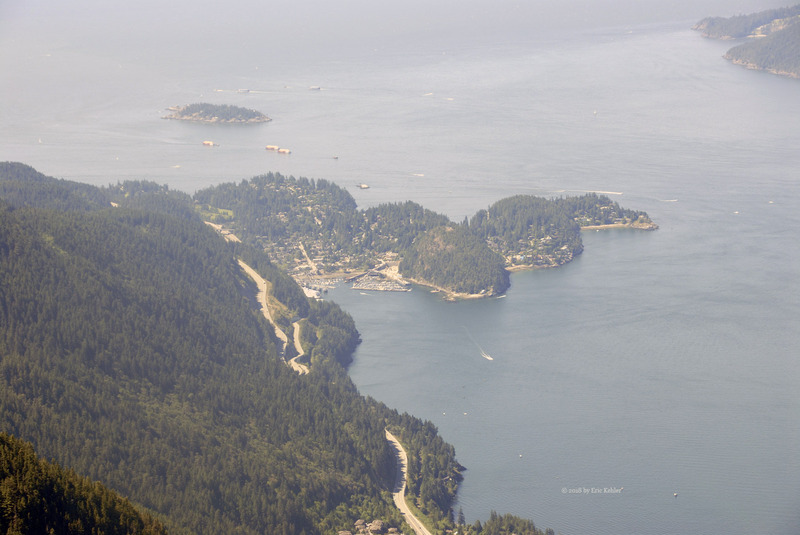 I made a few contacts including with a chap driving the sea-to-sky highway right below us! I soon got my 4 contacts but John was having trouble with 40m as Ralph’s signal was over-powering his radio, so he had to wait for Ralph to be done. But then he managed to get two other stations both of which were on other summits. It took quite a while to get his 4th. John ended up using my 2m setup but with the yagi pointed due north – straight at the granite face of the Lions! That worked and he had his 4 contacts. Done with making contacts we packed up the gear and started back for the car. The trail was challenging on the descent with all the rocks and roots but fortunately we made it across the challenges safely and soon we were back on the improved trail thankful to be done with the roots. The rest of the hike went smoothly with the tree of us hams chatting about various radios and antenna projects. There are a number of interesting ideas to try which may help make our weak signals more effective! Once back to the car and sitting down I could hardly wait to get the A/C going and some cool air blowing on me! We descended the road to John’s car and said goodbye, he would be returning tomorrow to start a 3 day hike along the same trail but continuing all the way north to the end! So it was a successful day, exhausting for Ralph and I but just a warm-up for John. Still, I look forward to hiking the next one.